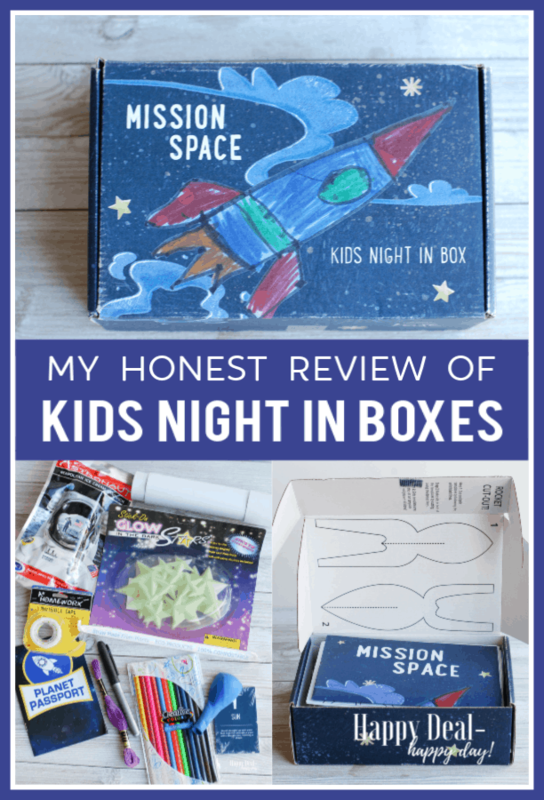 My Honest Review Of Kids Night In Boxes | Happy Deal - Happy Day! 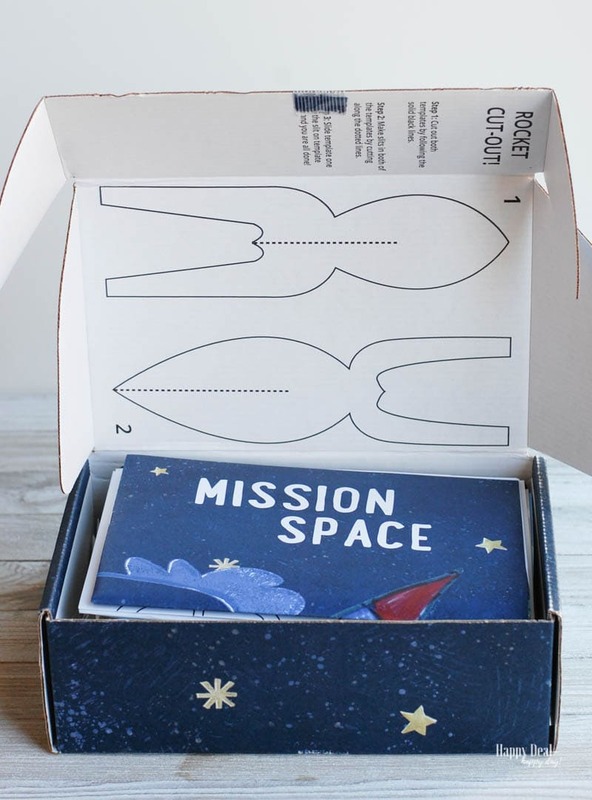 I recently had a chance to test out the Mission Space version of Kids Night in Box. There are two different versions of Kids Night In Boxes – the “regular” version and the “Faith, Family, Fun” version. I tried a “regular” version first, although I’m very curious and want to try a “Faith, Family, Fun” version next! We got the Mission Space box and it came filled with goodies. 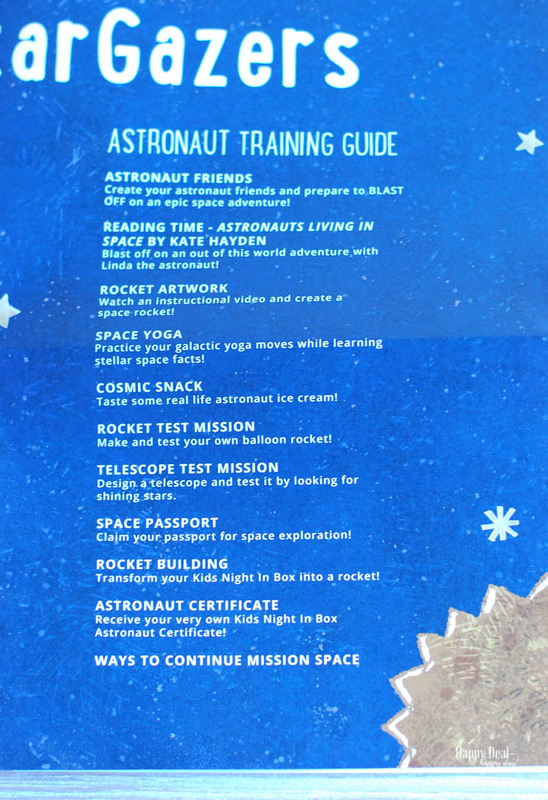 What you need to find first when you open your box is the “Mission To Space – Astronaut Training Guide” – which is your complete step by step guide and instructions for all of the activities in the box. There are 2-3 hours worth of activities in total in this box – and we spread it over two different nights. I created this Facebook Live Video after we completed about half of the activities our first night. As a former teacher, I can tell that smart educators are involved in the creation of these boxes, as it has an activity for every style of learning! I told my girls we were going to play school and that they had to call me “Mrs. White” and they came up with their own pretend student names. They were very excited and jumped right into their role as a student and were excited to learn with mom! The first activity we did was color our astronauts and taped them to the paper bags it came with to create puppets. My kids gladly used the puppets to answer comprehension questions about the book included titled “Astronauts Living in Space.” I mention a bit in the Facebook live video about how after reading the book, my 5 year old has for sure decided she does not want to go to space! But that didn’t hold her back for continuing to want to see what else was in the box! After reading the book, they watched a Youtube video teaching them how to draw a rocket using a sort of connect the dot style of drawing. Both of my girls loved coloring in the rocket they drew and decorated it with the space stickers. That is what we completed the first night in about an hour. Then there is a physical body movement activity where they can do different yoga moves that I believe were re-named with space names. While you hold those positions, there are interesting facts you can read to your kids about starts. 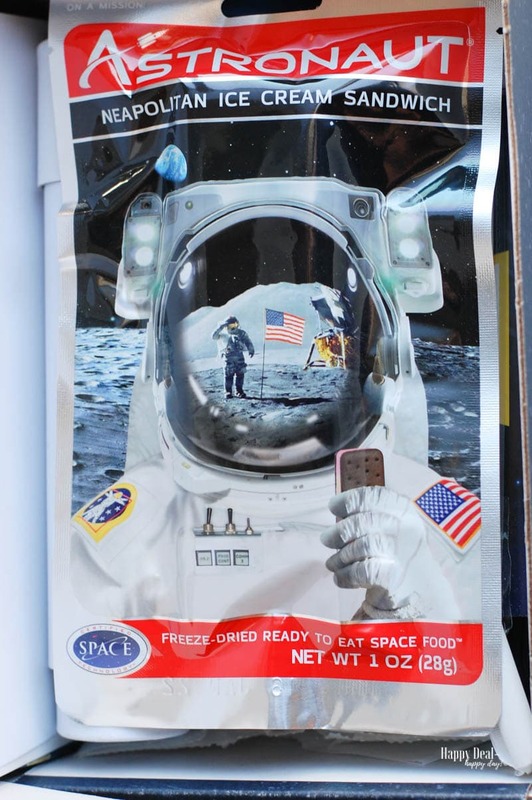 The second night we got out the box, we decided to start off by eating the freeze dried ice cream sandwich for dessert – the same kid of “icecream” astronauts have to eat! After the freeze-dried ice cream was all eaten, the rocket balloon demonstration was next. We turned the kitchen into a balloon rocket lift of station! The kids jumped up and down and giggled like crazy watching the balloon on the straw travel so fast down the string! The last two activities were to decorate a “telescope” that can be used for stargazing, and cut out shapes from the box to put together a small model rocket. 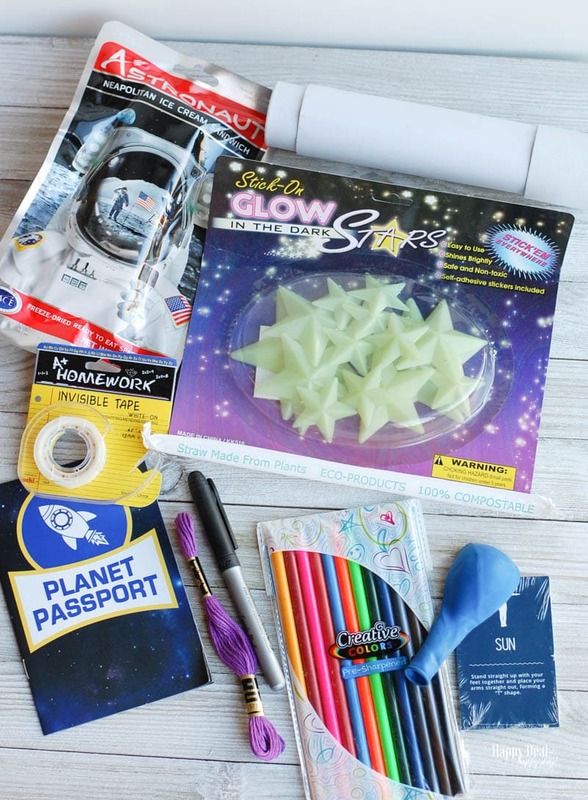 There also comes in it a pack of glow in the dark stars they can decorate their room with, and an official “Space Passport” parents can fill out for their kids and they can use again for imaginary play. The variety of activities for kids was perfect to hold their attention and involved all types of learning. It ranged from small motor skill practice with cutting and coloring, reading comprehension, large motor skill exercises, science demonstrations, taste testing, pretend play with the telescope and passport, and video instructions on how to draw. The only item we needed from our house to complete any of the activities was a pair of scissors. Everything else was included in the box – even the colored pencils and tape! The straw that came with it was compostable. All other parts of the box could be used again or recycled. I loved how they even made box it came it into an activity and used the cardboard from the box to create a model rocket. Many activities were experience based and not just another toy you get when you are done that isn’t played with for very long. My kids do not need extra toys that just take up space in their room, and there wasn’t any with this kit. There was 2.5 – 3 hours worth of activities in this box – so you could use it over a couple of nights if you wanted. The pretend telescope is fun for the kids to play with, but it didn’t magnify anything. I would have loved if there was just a small magnifying lens in it so it was a bit more realistic. I thought the model rocket would be more aerodynamic and you could throw it and watch it spin or something. But really – it was just two pieces of cardboard that you slide into one another. I would have loved if there was a stomp rocket in it instead. Otherwise, the kids just put stickers on the cardboard model rocket, and it will soon end up in the recycling bin. The glow in the dark stars came with little stickers so you can put them on your walls. Our package of stars must have been very old because the “stickers” it came with were not sticky at all and were actually starting to crumble. I’ll have to go to the store and get some poster putty to actually put the stars on their walls. 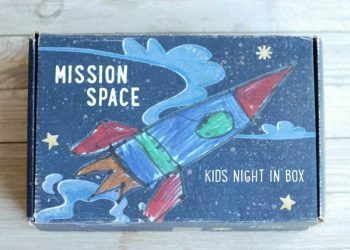 Even though there are hours of fun and engaging activities in Night In Boxes, I don’t think I’d want to pay $40+ per box. I’d LOVE to tell my parents and in-laws about this so that they can spend $40 per box (and I’m sure they would!) But as a frugal parent, I could take my kids to a matinee at the movies, and let them buy a couple of books and activities at the dollar store for cheaper. Would it be the same cohesive educational experience? Probably not. But I wish these were $25 per box instead of $40. Good news is that Night In Boxes often has promotions so that you can save money per box. 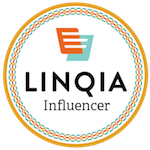 Right now they have an offer of getting 2 boxes for free with a 6 or 12 month subscription when you use promo code NIB2FREE. I do recommend you telling aunts, uncles, grandparents, or even put on a birthday party invitation that these make excellent gifts that are useful and educational. Go ahead and give it a try. If you do – be sure to come back and leave a comment on what you thought of your hours of fun in a box! 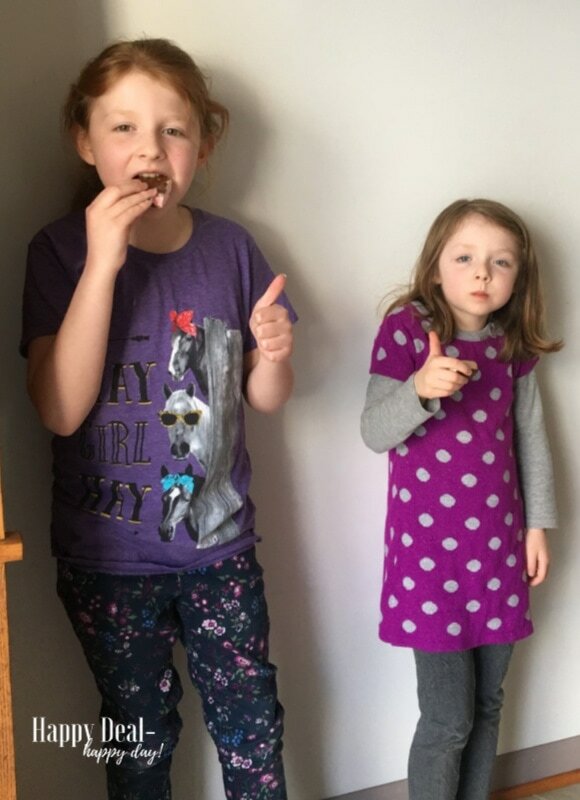 *I was given a sample Night In Boxes for Kids in exchange for my review. All opinions are my own.